What fanfiction(s) would you recommend? In East Blue Saga, (because it takes place in East Blue ocean, not in Grand Line) we first encounter the main character Luffy, who is trying to be the Pirate King and find One Piece. He encounters a swordsman, a navigator, a liar/sniper and a cook - these four people will later join his crew. However, for those four people to join Luffy, some obstacles must be overcome. One tried to show a marine that they can survive without food, but didn't know the marine was already planning the execution for them. Another was a thief trying to save one village from the hands of a fishman pirate and ended betraying the crew at some point too. The other one wants to go to sea, but isn't brave enough and can't abandon a friend either. And the last one is trying the best to pay back the favour for one old man, although wants to set off to sea too and find a legendary All Blue. In this Saga, the crew also gets their ship and friend in one too. After Luffy was able to somehow form his crew, they finally set off to Grandline - an ocean where is the rumored One Piece. They have to overcome some rather unusual moments such as running from big sea king monsters, sailing through some weather types in one go and after that, they first encounter a big criminal organization that has set their eyes in destroying one certain country. When the crew gets involved with the said country's princess, they don't have much choice but to help her get her back to her country. With the princess onboard, they also encounter giants and a new crewmember - a doctor that is rather unusual. Together, they reach the princess' country where they try their best to help her and stop the rebellion which was caused by the criminal organization. Luffy also reunites with his brother, which greatly shocks the crew, because they were very surprised to find out their captain even has one. After the ordeals in the previous Saga, the crew gets one more member - a shipwright, and they set their eyes on a Fishman Island. However, they have to stop because they encounter a mysterious skeleton and they are dragged in a fight with zombies, ghosts, shadows, and also a Royal Warlord. The place is absolutely crazy and the crew has no choice but encounter many crazy moments - such like seeing a unicorn drinking with a tree, fighting a cerberus with a fox's head, but the most strange things are zombies that act very similarly to some from the crew. The mysterious skeleton just spiced it more and he ends up fighting alongside the crew. However, what is this? Another Royal Warlord shows up with an intention to take the captain? How will this end? The place where these things happen are on one big ship in the size of a small island called Thriller Bark. The Saga is then named accordingly - the Thriller Bark Saga. Thriller Bark was certainly a nice place for the captain and other brave members, but it was certainly a scary place for others. The crew has another new crewmember - a musician; they are getting closer to marine headquarters as they are trying to reach Fishman Island too. They encounter a mermaid and help out her friend that has some past with the crew too. With their new friends they reach a Shabaody Archipelago, a place that seemed absolutely amazing, but the truth is the opposite. There are many dark things lurking there and the Dragon Kings - people from royal families - don't act very nicely. When one of their friend is kidnapped and auctioned, they help her and Luffy ends up wounding one of the Dragon Kings, resulting in marines to come to Archipelago too. The crew encounters a mysterious man that helps them with their escape from the marines and later, it is revealed he is a living legend, which greatly shocks the crew. Their surprise and excitement doesn't last long however when they get into another confrontation with marines. This time, they have to deal with a marine admiral too, and as if it wasn't enough, many enemies that look like one Shichibukai show up too. The crew struggles greatly and in the end, they are utterly defeated and sent somewhere. 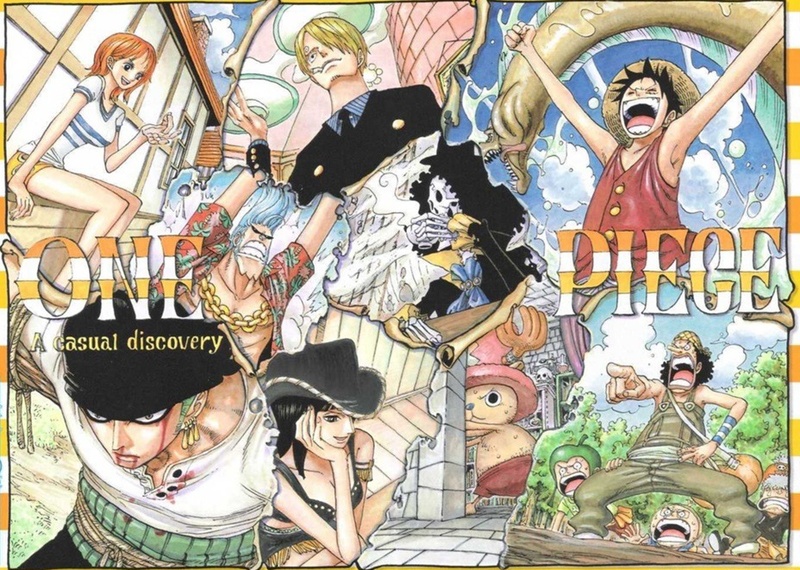 Luffy ends up in a place full of women warriors, and here, he finds out something that shook him entirely - and his decision with the decision of another party will also shake the whole world when pirates and marines will fight over one man's life. After that, Luffy delivers a mysterious message to his crewmembers in order to meet back safely in the designated time. Because the war of marines and pirates was the biggest issue here, the saga is called the Sumit War Saga. For some time, the crew will be separated until their reunion 2 years later in the second biggest saga: The Final Sea: The New World Saga.